Guest Blogger and Author Luanne Castle! Guest blogging at Phil Taylor’s today about FLASH NONFICTION! Thanks, Phil! How did prose, namely flash nonfiction, end up in my new poetry chapbook Kin Types? The easiest way to think of flash nonfiction is to think about a creative essay and imagine it tiny—50, 100, 500, 1000 words. Once I started trying my hand at flash nonfiction, I saw that flash nonfiction forms are just poems opened up a bit—made a little larger, a little looser, but also relying heavily on sound, diction, images, just as poetry does. I was able to work my subject in both poetry and flash nonfiction simultaneously because the two genres occupy the same sort of creative process. What in the World is a Chapbook? Sometimes we get so used to the jargon of the field we’re in that we forget it’s a specialized language. And that others don’t always know what in the heck we’re talking about when we use it. I was thinking the other day that when I say that I wonder if Perry is a feral cat or a stray cat that the nuance between those two types of cats could be lost. A feral cat is so wild that he is not used to humans or civilization and oftentimes cannot be persuaded that we are ok. Unless quite young when the socialization begins, it might not be possible to ever get a feral cat to accept human touch. But I say that with a caveat: every cat must be treated as an individual because you just never know which feral cats can be socialized and which socialized cats will never be lapcats–based on temperament, environment, and so on. Speaking of Perry, I have been reading him Cindy Rinne’s story in verse Quiet Lantern about a Vietnamese girl named Mai Ly who is on a spiritual quest. The farther I go into the story and the more poetic prowess I discover, the more impressed I am with the book. Another word I’ve flung around the blog lately is chapbook. Kin Types is a chapbook, rather than a full-length poetry collection like Doll God or like Rinne’s book (which is over 100 pages). But what is a chapbook? Historically, a chapbook was a small pamphlet that was truly around before books as we know them today were invented. The first written fairy tales were chapbooks. They were small. They were a few pages. And they were really roughly printed. 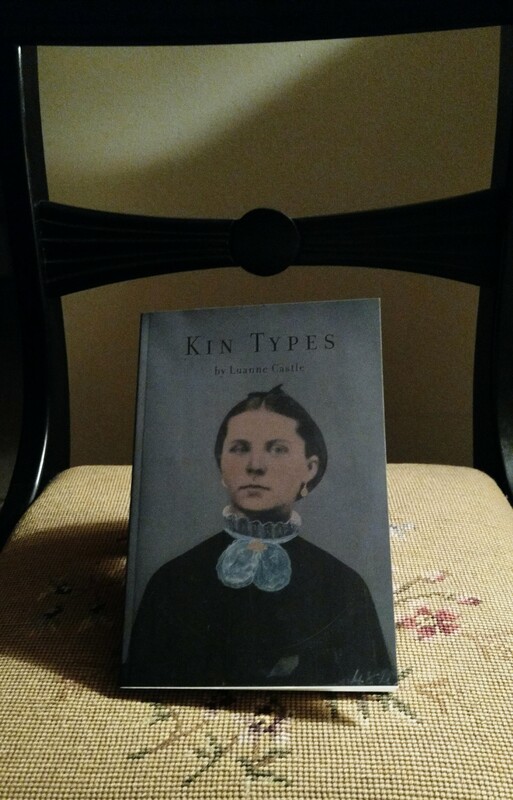 I did enter Kin Types in a few contests, but they are expensive (entry around $15-25 each) and when the manuscript was accepted by Finishing Line Press for publication, I decided to go with them, rather than spend more money on contests. Still, Kin Types was a semi-finalist in the Concrete Wolf chapbook contest and a Highly Commended title in The Fool for Poetry International Chapbook Competition. The only writing I’ve been able to do lately is a poem for my son’s wedding. It’s being framed and will be on a table with photographs of the grandparents (of the bride and groom) who have passed on. Today is the anniversary of my maternal grandmother’s birth in 1912, two days after the Titanic sank. Her birthday was two weeks after that of my paternal grandmother (though they were born 19 years apart). They were both Aries, as is the Gardener. It’s hard to think of anything that is similar about the three of them, except that they have all been count-on-able. My maternal grandmother’s name was Lucille Edna, although she was known as Edna. (Luanne is created from Lucille and my mother’s middle name Ann). Edna was Class Historian at graduation (her older sister was Salutatorian the same year) and always wanted to be a writer. She thought of herself as the “Jo March” of her family (like in Little Women). When she was elderly and ill, she made me promise I would never give up writing. That comment from Grandma found its way into a Kin Types poem. Tagged as #amwriting, book contests, chapbook, chapbook contest, Doll God, Family memories, National Poetry Month, Poem, Poet, Poetry, poetry chapbook, poetry collection, Quiet Lantern by Cindy Rinne, reading to cats, rescue cat, What is a chapbook?